An MP is calling for better protection for fruit pickers and other agricultural workers who are being paid as little as £19 a week. 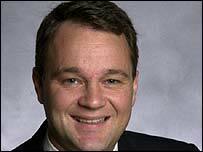 Lincolnshire MP Mark Simmonds wants so-called gangmasters who organise agricultural crews to register their workers. He is calling for the new legislation to protect legitimate workers from exploitation. At present, employers do not have to register their workers, but Mr Simmonds wants a compulsory registration scheme introduced. "The legitimate suppliers of labour are being undercut and undermined by those who are working in the black economy," said Mr Simmonds, the Conservative MP for Boston and Skegness. "They do not pay their workers sufficiently and there is exploitation taking place." Many of the fruit pickers come to the UK to work in the hope that they can return home with money for their families. They respond to advertisements in Eastern European newspapers offering highly paid work and good conditions. 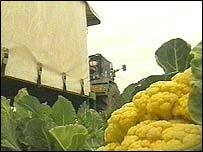 Almost 30 Eastern Europeans were found working illegally picking daffodils in Lincolnshire in April 2002. "Often deductions are taken off the employee's wage packet for accommodation and transport and these costs are often exorbitant," Mr Simmonds said. "One Eastern European woman had a wage packet of £149 and after deductions she only had £19 a week - that is exploitation." Roger Welberrry, who grows vegetables on his farm near Boston, said earlier this year that he was being undercut by growers employing workers on less than the minimum wage. "We don't want these rogue gangmasters using illegal workers because they are disadvantaged by that," he said.